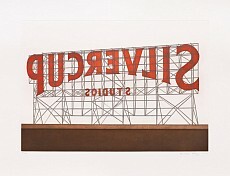 Thatcher Projects is pleased to announce the publication of Silvercup though Pace Editions, Inc. An aquatint and soft ground etching produced in an edition of 30, this print of the artist's 2014 painting of the same title is based off the iconic signage located in the Long Island City skyline. View the original painting on our website. Thatcher Projects is pleased to announce an upcoming solo-exhiibition of artworks by Australian artist Gary Carsley at the Visual Arts Center, NJ. OpeningSunday, February 8, 2 pm – 4 pm. 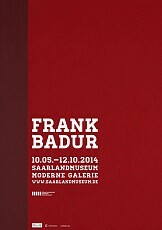 View images and learn more about this exhibition. Adam Fowler in the Seventh International Distinguished Artists Symposium and Exhibition, Joseloff Gallery, Hartford Art School. Thatcher Projects is pleased to announce the inclusion of gallery artist Adam Fowler in Somewhere Between Creation and Destruction, the seventh International Distinguished Artists Symposium and Exhibition at the Joseloff Gallery, Hartford Art School. Established at the Hartford Art School in 1994, The International Distinguished Artists Symposium and Exhibition is a grand showcase for the work of internationally known artists featuring challenging themes and a week of lectures and discussions leading up to the exhibition. Curated by Joseloff Gallery managing director, Lisa Gaumond, the exhibition explores works featuring paper as the central medium used to express the artists’ message and emotion. Paper may be sliced by hand, torn, or laser cut; pieces may be traditional, flat, and decorative; they may be layered, reconstructed, and sculptural. Thatcher Projects is pleased to announce the inclusion of two gallery artists - William Betts and Maria Park, in That’s Where You Need to Be a group exhibition at Richard Levy Gallery, on view August 1 - September 19, 2014. 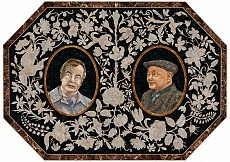 Other artists in the exhibition include Xuan Chen and Willy Bo Richardson. 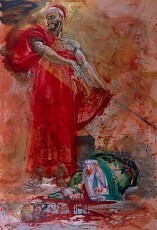 Each of these artists expand the conventions of painting by executing their own unique styles and methods of application. Two major paintings by German American artist Rainer Gross, (Die Behauptung der Moderne I, 1982) and TV II Baroque, 1979) included in an exhibition of German Expressionist paintings at the Shanghai China Art Museum. Considered a movement with major influence on Chinese modern art since the 1980s, this is the first proper exhibition ever held on the Chinese mainland. The Institute of Modern Art is pleased to present the new installation Sciencefictive by Brisbane-born, Sydney-based established artist Gary Carsley. This immersive project transforms two galleries into an interior garden, seen through apertures, or Moongates, that puncture the white walls of the gallery. 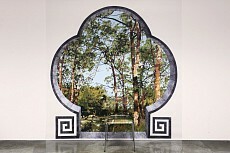 As visitors follow a path laid throughout the galleries, they will encounter these Moongates, which serve as windows onto gardens from around the world. These are displayed in the IMA galleries in a physical relationship to each other that they would have if Brisbane were the centre of the world. The entire work therefore functions as a giant mappa mundi, and encourages us to contemplate the complex balance between social construct, geography, and flora that characterises gardens. While today’s gardens are typically produced by landscape architects, Carsley suggests an affinity between the process of conceiving and creating a garden and that of the artist—bringing land, sea, and sky together into evocative spaces that offer journeys and compel reflection. The gallery is pleased to announce Gary Carsley's inclusion in It's Timely, a group exhibition at the Blacktown Arts Centre, Blacktown New Soth Wales, Australia. On view from April 29-June 28, 2014. It's Timely is framed by the two speeches Edward Gough Whitlam delivered in Blacktown in 1972 and 1974, rallying for racial and sexual equality. The artists images document the changes that completely transformed life and culture in the island continent. Margaret Thatcher Projects is pleased to participate in the ninth edition of PULSE New York Contemporary Art Fair, May 8 - 11 at The Metropolitan Pavilion. The gallery will be presenting a solo booth of the Ethiopian artist, Tegene Kunbi. Kunbi lives and works in Berlin, having left Addis Ababa to further his painting studies with an esteemed group of professors at the Universität der Künste Berlin. 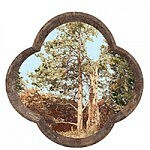 View images from his current exhibition at the gallery, Melting Pot. The fair will feature new and returning international galleries, spanning eleven countries. Over seventy five percent of exhibitors, including Thatcher Projects, will present solo, two or three artist presentations, which are integrated throughout the fair as PULSE, IMPULSE, and POINTS exhibitors, thereby encouraging connectivity between artworks, galleries and visitors and emphasizing the fair as a platform for discovery. Click here for visitor information. Support community programming and outreach programs such as Artists with Disabilities and Arc, the Young Scholars Program, SAGE Elder Care: Art from the Heart and The Connection for Women and Families at the Visual Arts Center of New Jersey by participating in "For Art's Sake", a silent art auction and benefit on Saturday, May 3, 7:30 - 10:30 PM. The auction will include works by gallery artists, Omar Chacon and Adam Fowler.